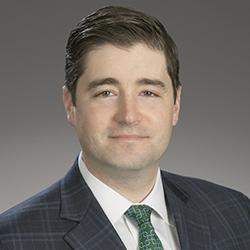 James Morrissey is an associate in Brown Rudnick’s Real Estate group in the Hartford office. Jimmy's experience includes real estate, public utility, energy and environmental law including transactional, regulatory representation, and litigation. Prior to Brown Rudnick, Jimmy worked as in-house counsel to a global energy company where he represented numerous subsidiaries in the development of large infrastructure projects, real estate transactions, regulatory proceedings, and environmental compliance. Jimmy has frequently appeared before Connecticut's Public Utilities Regulatory Authority and the Connecticut Siting Council. While in law school, Jimmy served on the Fordham Environmental Law Review. Prior to attending law school, Jimmy managed an energy efficiency program in Connecticut for low-income utility customers. Jimmy provides pro bono representation to animal rescue and shelter organizations. Additionally, Jimmy is a Connecticut Department of Agriculture approved court appointed animal advocate.